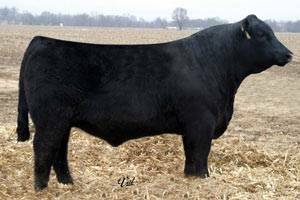 Special Delivery is a massive, deep sided, big bodied, soft made homozygous polled and homozygous black GLS Combination son. He stand on a big foot and is great on the move. He has a big square hip, a huge top, and is wide based. He is a high growth bull in a moderate frame with tremendous ultrasound data. He has a 18.5 inch REA and ratioed 125 on REA and 123 on IMF. A true beef bull with a cool look!